Having lived in Florida since 1991, The Buchanan family decided to build their dream home earlier this year in St. Petersburg, Florida. Building started in the Summer of 2017, but the Buchanan’s wanted to get a leg up on the building process by getting information about cabinets, appliances, and countertops beforehand. “We had all of our Interior Colors picked out and put together a palette, so it was just a matter of finding a stone that matched and complemented the rest of the colors we chose.” Mrs. Buchanan said. Knowing she wanted lighter cabinets, Mrs. Buchanan took that into consideration when thinking about the countertop color, leaning towards something gray or darker to contrast against the cabinetry she chose. Mrs. Buchanan started the Countertop Buying Process, by first looking online where she stumbled upon Cambria. The Buchanan’s went to two granite shops before coming to International Granite and Stone. From there, the Buchanan’s scheduled an In-Home Consultation, with IGS Designer Pedro M., to go over the scope of work in more detail, and to finalize what colors were going to go where. Seeing as it was a new build project, The Kitchen, Bathrooms, and Laundry Rooms needed something for the surfaces. The Buchanan’s also decided to add an Outdoor Kitchen as well. “We were pleasantly surprised with your price, and we loved the International Granite and Stone Showroom in Odessa. The Showroom’s presentation is what won us over. We even got some of our cabinet ideas from your setup.” Mr. Buchanan said. For the Kitchen, The Buchanan’s chose Cambria Bellingham Quartz. Quartz is a great material to use due to the fact that it doesn’t absorb any liquids or moisture. It’s the perfect surface for cooking, preparing food, and entertaining friends. The Buchanan’s chose an Ogee Flat edge for the Kitchen, to jazz up the countertops. A Quartz Kitchen can vastly increase the value of your home. The color they chose matches the cabinetry flawlessly. For the Laundry Room, The Buchanan’s chose Cambria Bellingham Quartz. The color they chose matches the cabinetry in each space flawlessly. With an In-Home Appointment and Pedro M.’s Help, the Buchanan’s Chose Cambria Bellingham Quartz, for Its Immense Durability and Low Maintenance. Cambria Quartz Is an American Made Quartz Product Manufactured out Of Le Sueur, Minnesota. Lighter Colors Are Preferred to Customers. Cambria Quartz comes with a Lifetime Warranty from the Manufacturer. Buy with Confidence; Quartz Countertops are Stain Resistant and Scratch Resistant, and Never Require Sealer, Unlike Granite or Marble. Cambria Bellingham Is A Part of Cambria’s Waterstone Collection. For the Master Bathroom, The Buchanan’s chose Baltic Brown Granite. The color works perfectly with their color palette, matching the mirrors and sink fixtures to a tee. This Granite Master Bath is a timeless classic. In the Guest Bathrooms, The Buchanan’s chose Verde Butterfly Granite. Verde Butterfly Granite is a beautiful blend of greens, shade of blacks and whites with dark veining ideal for any application. The color works perfectly with their color palette, matching the mirrors and sink fixtures to a tee. Lastly, the Buchanan’s chose the same Baltic Brown Granite they used in their Master Bath, for their Outdoor Kitchen. Granite is an ideal stone for Outdoor Kitchens because it doesn’t fade easily in the sun. Mr. Buchanan designed the Outdoor Kitchen as his own personal cooking space because of his love of grilling out. They use the grilling area about two to three times a week and chose Baltic Brown for a more natural look to match the pavers and brick veneers. The Brick veneers are also featured inside in the Buchanan Living Room around the Fireplace. With Pedro M.’s Help, the Buchanan’s Chose Baltic Brown Granite for their Master Bathroom and Outdoor Kitchen, for Its Durability and Style. They also Chose Verde Butterfly Granite for their Other Bathrooms. Baltic Brown and Verde Butterfly are Granite Stone colors. The Granite is Quarried and Manufactured, Baltic Brown Granite from Finland, and Verde Butterfly Granite from Brazil. Brown Colored Countertops Are Neutral Favorites with our Customers. Granite does, however, need to be sealed, to block out stains, excess moisture, and damaging liquids. We recommend resealing your Granite Countertops once a year. 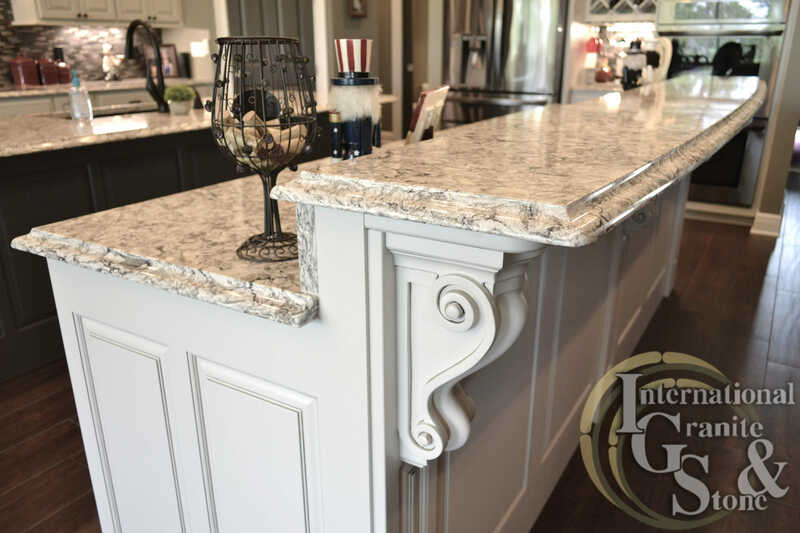 Buy with Confidence, we have over 16 years of Fabricating and Installing Granite, Quartz, Marble, Soapstone, Onyx, and more in Kitchens and Bathrooms across the State of Florida. At International Granite and Stone-St. Petersburg St. Pete Beach, We Make It Easy to Get Kitchen, Outdoor Kitchen, and Bathroom Countertops for your Home. Shop Online, Call us to Schedule a Free In-Home Appointment or Visit our Natural Stone Warehouse and Gallery in Tampa, Featuring: Granite Slabs, Cambria Quartz Slabs, Quartzite Slabs , Kitchen and Bathroom Displays, Samples and More. At International Granite and Stone, Customer Satisfaction is our top priority. We’ve worked tirelessly for over 16 years to establish a loyal client base in the Tampa Bay Area.